Styled with a delicate twisting design, these elegant creole earrings are crafted in classic 9ct gold for a polished finish. Wear with complementary yellow gold jewellery for a coordinated finish, or contrast with bright jewel tones for a contemporary colour clash. 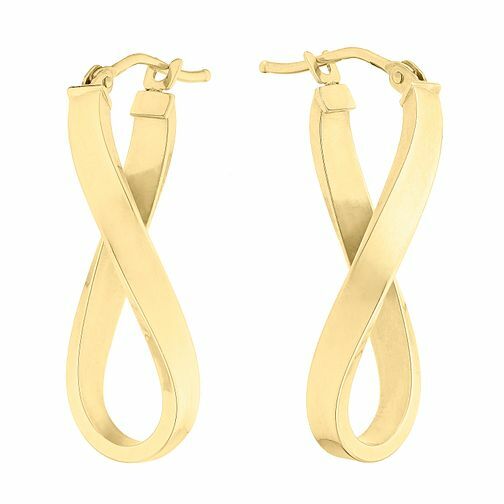 9ct yellow gold long twist creole earrings is rated 4.8 out of 5 by 4. Rated 5 out of 5 by Anonymous from Excellent service and earrings I am really pleased with the service and my purchase of these beautiful earrings form Earnest Jones. Rated 5 out of 5 by Anonymous from Lovely pair of earrings Perfectly sized and weighted, these earrings look lovely on my wife. They are a distinctive, timeless shape and its a purchase i'm glad I made.